Confession time: I love Quentin Blake. I wouldn’t dare try imagine my favourite Roald Dahl books without him. One of the joys of parenthood has been sharing the stories I loved as a child with my own daughter. That is, until she learnt to read by herself, just as we were getting to the good stuff. Still, I have another two chances, right? We’re going on a drawing hunt! 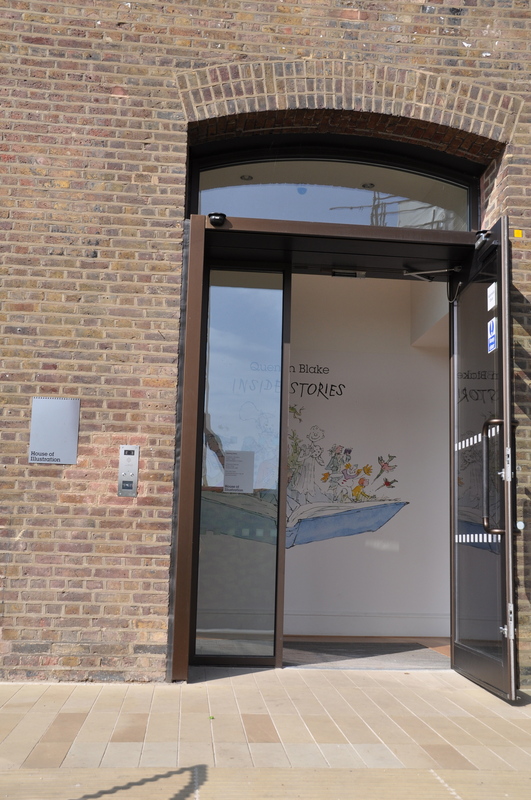 Quentin Blake: Inside Stories is the opening exhibition for The House of Illustration, or as it calls itself, ‘the home for the art of illustration’. Given that it has been pledged Blake’s archive and library, I’ve been very excited about taking my drawing mad daughter there. We took a visit with the whole family plus adult friend. The House of Illustration is sited in a rapidly regenerating part of Kings Cross. As you take the short walk from the train station you’re welcomed by wonderful giant illustrations covering the hoardings, showcasing the variety and brilliance of illustration today. The House is just off Granary Square, recently landscaped with fantastic fountains, just begging to be jumped in! The building itself is just tucked off the main square. It’s a small place – if it really was a house, and I was an estate agent, it’d be described as bijou. The welcome lobby houses a delightful shop, as well as the ticket desk. Unfortunately on the day we visited there were problems with PayPal, so they couldn’t take card payments. In this new cashless economy (don’t even try and board a London bus with hard currency!) this sent us into panic. There was a sticky moment where we established the nearest cashpoint was a 20 minute round trip, and no, we couldn’t pay on the way out, but luckily we scraped together enough to get in. The Quentin Blake exhibition is housed in a small space of just three rooms but manages to show some wonderful material within that space. The opening part is a handdrawn table top showcase where Blake explains the process of illustrating – it looks as if he’s just scribbled it there for you personally to see. The next room explores six of Blake’s book illustrations in greater detail. Seeing the original sketches and artwork for The Twits was a personal highlight – I remember reading that story to my older sister when she was ill, and I was 9 years old. I also saw material from more contemporary books, such as The Boy in the Dress by David Walliams. There was also artwork for non-children’s books – you may wish to avert your child’s eyes from the breast groping in Voltaire’s Candide! Most moving was the artwork in the final room for Michael Rosen’s The Sad Book, written as he struggled to come to terms with the loss of his son. Unfortunately I found it difficult to engage my children with the displays as much as I hoped. The toddler was, well a toddler. They’d thoughtfully provided folding stepping stools in the lobby which he enjoyed carrying around. However the only way he could pull himself up on the stool to view the works was to use the picture frames to steady himself – which we were duly told off for. I’d expected more from my daughter, an avid reader of Dahl and David Walliams. Part of the problem was the activity sheet she had been given on the way in. One half distracted attention from the displays – she was too busy thinking of things to add to Mr Twit’s beard to look at the real mccoy! The other side of the sheet was much more successful – asking her to find and draw different emotions onto otherwise blank faces. She then studied the illustrations in much more detail, looking for examples of the various feelings to draw onto her own sheet. After we visited the South Gallery or activity room. Overall, this seemed like a bit of a sparse afterthought. 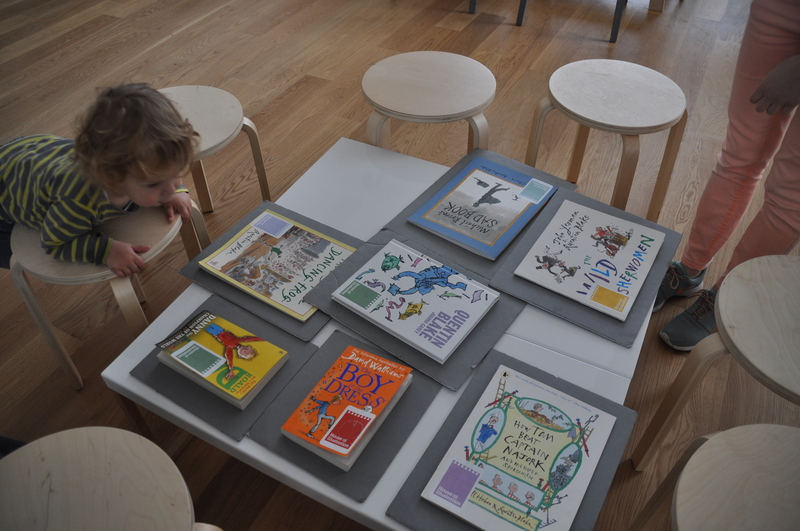 Copies of the books were available on a table to browse, but the stools were at an awkward height compared to the table so it wasn’t a comfortable spot to have story time. There was also a drawing station, which had a couple of specially designed colouring in sheets – these were mildly diverting. The best bit was a couple of great videos – my favourite being where Blake created The Twits artwork in his studio, explaining the process in his own words. My daughter also enjoyed this. Unfortunately the screen’s off button was just at the right height for the toddler to hurtle across the room and switch it off, much to the quiet consternation of other visitors. We had to get a staff member to turn it back on *embarrassed mum* and strap the toddler in the buggy to stop it happening again. It may be a house, but it’s not yet a home. Considering the creative subject matter, their own brilliant branding, and the dynamic area they are situated in are, this energy didn’t quite come through in our visit. People, passionate about illustrating are what I think the place is missing – but not for long I hope as they’re currently recruiting for volunteers. More interactivity would make the place more exciting for family visitors – and other guests too! For example, the video showed how Blake uses a light box to draw over a ‘rough’ to create a final drawing. He also talks about the type of nibs he selects and why. A mocked up studio with a working lightbox, paper, inks and a selection of nibs (tied to the table if need be) would really help people learn about Blake’s illustration method through doing. Special children’s illustration workshops are run – however these have all sold out and no future dates have yet been announced, although more are in the pipeline. 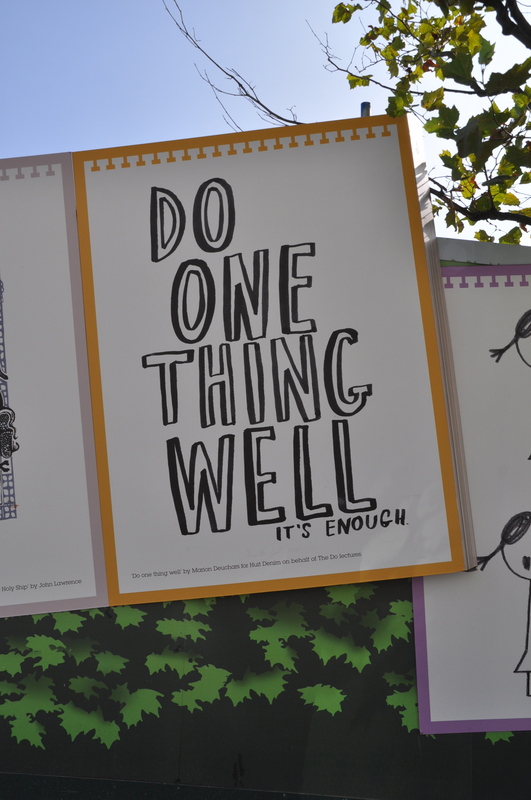 And if space is a premium – do chalking sessions outside, or make illustrating toolkits available for families to explore the area. Bearing in mind this is the House of Illustration’s first exhibition, I’m very excited to see how it develops over time. I’ll definitely be back to do some Christmas shopping in the gift shop. And I can’t wait to try one of their workshops! Booking: There’s no booking fee, so you might as well. We turned up with immediate entry, but I notice some days are marked as sold out on their calendar. Recommended length of visit: An hour or so. Buggy accessible? : Yes, level access and they’ll store them for you behind the reception desk too. Baby changing: A fold down table with a strap, and adult toilet too. It could do with a clean and tidy up though, as it was storing WAY too much paper towels! Breastfeeding friendly? : There are no chairs in the exhibition and only one in the shop right opposite the door-way. Your best bet is the activity room, which has seats for the film screening and colouring-in station. Toddler time to toilets: Less than a minute. 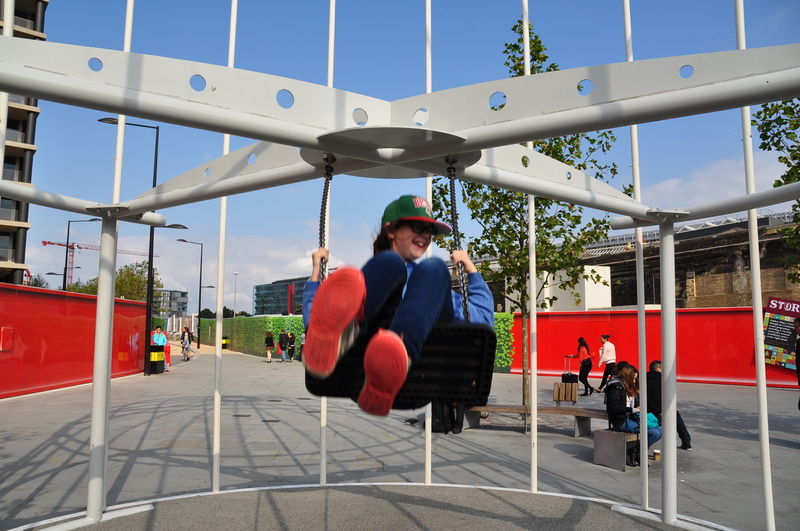 Nearest playground: We couldn’t resist those fountains in Granary Square – and the September sun obliged! There’s also a swing (well actually an artwork, but it contains a swing, so let’s just call it one, shall we?) next to Kings Cross. You could also try Camley Street Natural Park, a small green oasis on the site of a former coal yard. Food: No food is available onsite. We had fantastic coffees, ‘the best hot chocolate ever’, cakes and biscuits from the nearby Caravan. Well, I didn’t because I’m on a dairy-, soya- and caffeine-free diet, but I’m assured they were ace and the latte art impressed Museum Dad. We’ve previously enjoyed eating at the street food market, Kerb, in Granary Square (Mon-Fri). To picnic, there are benches and tables around the fountains and grass steps overlooking the canal. Want to make more of a day of it? : Stroll to London Canal Museum, see Eurostar trains depart St Pancras International,or check out what’s on in Kings Place.